Small town with 9,168 inhabitants on the Great Plain on the western part of the area between the Tisza and the Danube at the meeting of three historic, ethnographic regions: Kiskunság, Bácska and Kalocsai Sárköz. The Holy Trinity church, built in 1802, with its neo-Classical main altar, can be found in the centre of the town. The 'Well of Roman Gods' and the monument of liberty can also be found in the centre of the town. 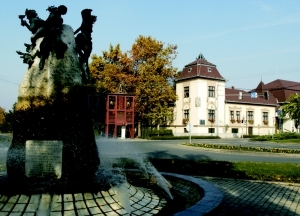 A fountain with a rotating sphere and monuments of World War I. and 1956 can be found in the 4 hectare grove. Besides an exhibition on the history of the town, temporary exhibitions are also organized in the Museum of Local History. The Pintér Works Museum of Military History and Park of Military Engineering, which is unique in Central Europe, can be found on the southern part of the town. Its sight, the Red Marsh is a nature conservation area. Most of its flora and fauna is protected. There is also a thermal bath in Kecel. Outstanding programmes: Bács-Kiskun County and Regional two-in-hand coach championship on the second weekend of May, Spring Welcome Flower Festival by T.G. Flower Decoration and Vocational Institute on the last weekend of May, OFF ROAD Jeep festival on the third weekend of June, Alföldi Vintage Festival on the third weekend of August, Flóra Flower exhibition and competition of flower binding, National exhibition and competition of potters on the first weekend of December.